- NO SELLING OF BURNT CD's / MIXES. - NO POSTINGS ABOUT SHARING VINYL RIPS OR UNRELEASED/RETAIL CD`S. You can however inform people about upcoming mixes, your sets (not for sale), etc. Should you be unsure as to what can and cannot be advertised, please seek the permission of a Mod / Admin BEFORE you push the topic on the forum. If you have an issue of compatibility or suddenly you feel the levels of Testosterone SHOOTING UP in your veins because of an argument with someone on the forums, rather than making a public mockery of it, seek the assistance of someone on the team. Putting on your gloves is gonna get the both of you booted. Why BOTH ?? Simple.... we're not going to take sides. All in all, this is a peaceful place and we would like to keep it that way. Should there be any reason to change this, we will let you know. What is the [ms] DJ Database? The [ms] DJ Database is a growing collection of EDM-related DJs and Producers. Each artist profile contains relevant website links, photos, biographies, monikers, tagged threads in our forum, and more. Thread are tagged to the artists, which will then appear in a live feed on the [ms] homepage. Make sure you update your bookmarks to this page--it will always contain content related to all of your personal favorite artists! Subscribe to your favorite artists! You can subscribe to an artist by searching for them in the [ms] DJ Database. A button exists at the bottom of their profile screen that will let you subscribe or unsubscribe to content posted about them by other [ms] members. When you subscribe to an artist, a live feed of their content will appear on the [ms] homepage. View all of your favorite artists by going to the [ms] homepage and checking the "Favorite Artists" pane on the right side of the page. 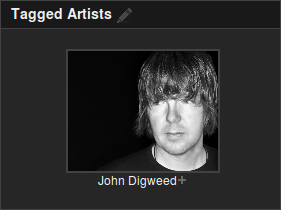 To tag an artist in a new thread, there is a "Tag Artist" field in the New Thread screen. Type a couple letters of the artist's name, click search, then select the artist in the results to tag them. You can only tag one artist while creating a new thread, and multiple can be tagged once it has been created. Additional artists can be tagged to a thread by clicking the pencil icon in the Tagged Artist window while viewing the thread. You can only tag an artist to a thread if you are the thread's creator. - Attempt to complete every field; search Google if possible. Don't submit an artist if you aren't willing to spend five minutes researching them! - Review all bios for formatting/pasting errors! What is the [ms] Record label Database? 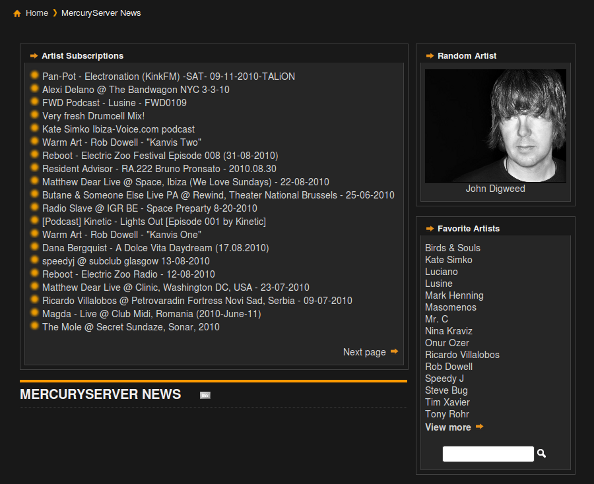 When you register on Mercuryserver you have instantly access to a well maintained forum for non commercial mixes. Check out the forum 'Promos and recommendations' on Mercuryserver to get an overview and browse the different subforums to find what you are looking for. You can also directly access our internal archives for especially highlighted Transitions LIVE shows from John Digweed and you can download the exclusive mixes made for our website birthdays. You can see these forums if you browse the section '[ms] DJ Mixes Archive' on this messageboard. There, you will also see forums where you can't see the content. Since traffic is not for free, not everything can be offered to all our registered members simply because we can't afford it. To get access to more Downloads in our internal Archives, you need to be an active poster in this community and have a certain amount of postings to be able to download everything we are offering. Thanks to people who flooded the board with spam posts only to reach the required number of postings, you now need to find out on your own how many postings you need for the internal archives. Try it out from time to time if you have enough postings to access everything in the internal Archives and don't ask us about it. It happens when it happens and where would be the fun without a little mystery. As you have just heard, Participation is required to get access to the Archvies but even after you have the required amount of postings, an ongoing participation is still mandated. If you do not have the time to be part of our community and post from time to time, try to get the sets we offer from different sources and stop bitching about it in the Forums. People posting meaningless topics and threads (constant replies with only very few words, posting emoticons all the time and endlessly saying thanks in threads for example) only to stay active and to be able to download will be blocked from downloads so don't even try to as you will be most probably recognized and blocked. All times are GMT -4. The time now is 02:00:44 AM.